Successfully Added LED Light Bulb with Neg-Ion Generator - White (6W) to your Shopping Cart. LED Light Bulb with Neg-Ion Generator - White (6W). Energy efficient white 6 watt LED light bulb for use in any standard incandescent socket. This professionally designed LED light bulb (often called LED lamps in the trade) fits into any standard incandescent lamp socket. Our G60 model produces a white color light and emits enough light to replace incandescent and CFL's for many ambient lighting tasks. In addition to all these benefits, our new model G60 also has one additional benefit, it also has a negative-ion generating base to help reduce the dust and airborne particles that can build up in today's enclosed homes and small offices. Thereby both reducing energy use in your home or office as well as making the air cleaner. Great for retrofitting into existing desk lamps, wall sconces, pendants, down lights, these white LED light bulbs deliver smooth and uniform light distribution without any flicker. In addition, these LED lights provide particularly good eye friendly task lighting for computer desks. Chinavasion offers this new technology LED light bulb with Factory direct low china wholesale price. Then you can stock up on this new LED lamp to retrofit your house, or better yet, sell them at your online / physical store or feature it in your latest eBay, Amazon or uBid listings to share with others while making money for yourself! 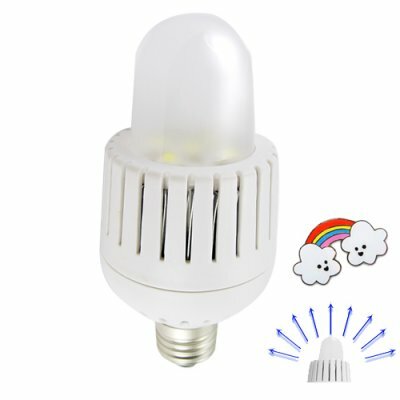 LED bulb with white color light for use in any standard screw-in light socket. Uses only 6 watts of energy. Fits into the same lighting fixtures as a standard incandescent bulb. Provides uniform, diffused light output. These L.E.D. bulbs work most satisfactory when used to replace 40-60 watt incandescent in desk lamps, downlights, wall fixtures, or multi-lamp pendants. These LED lamps decrease high maintenance costs by reducing the number of times a lamp needs to be replaced. Negative Ion Output: >1,000,000 ions / cm3 / sec. The anion output is great for rooms lacking fresh air. on 2010-01-22 00:09:51 I'm blind! Excellent light. Thought att first it was broke but when it came one I was blinded by the ligth. Been waiting long to get my hands on a strong LED light. The brightness is surprising for LED. This light can light up a room equivalent to 60wat incandescent.